One hundred years ago, High Point, and the surrounding region, became the epicenter of the booming American furniture industry. In the decades that followed, the city became known for its community of craftsman, network of vendors, and its biannual High Point Market—attracting some 60,000 visitors twice a year. Yet we see an opportunity for a stronger future. Plant Seven is a first-of-its-kind, 100,000 square foot, center for culture and innovation in High Point. 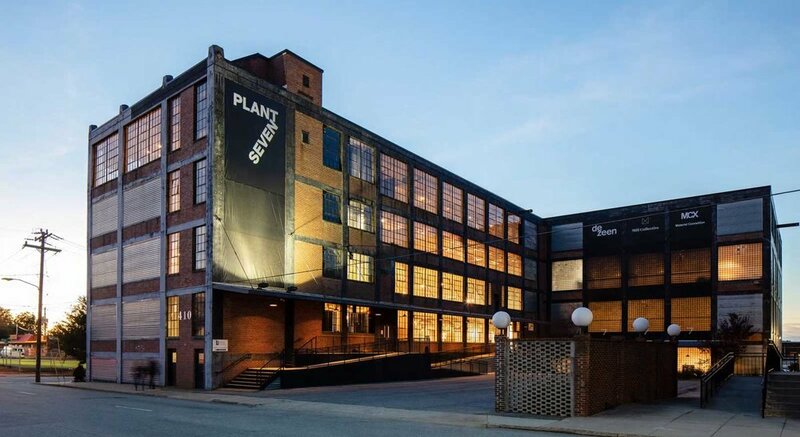 Designed to revitalize the city’s downtown, Plant Seven was established to honor its legacy of furniture-making and energize its creative spirit. Plant Seven provides resources and a platform for emerging designers, makers and entrepreneurs to work, collaborate and exhibit. The multiyear project opens in October 2018 with exhibition and event spaces, a photo studio, retail pop-ups, and the Material ConneXion library. The Plant Seven CoWork, café and hotel will be opened in future phases. Plant Seven is home to HP365, a 5013C non-profit, led by CEO Tim Branscome and Chairman Mark Norcross. The project has received support from the state of North Carolina, David Cogdon, Bill Millis, Business High Point, IMC, Blue Ridge Properties and High Point University. We’re glad we get to keep in touch. You will receive a confirmation email from us shortly.